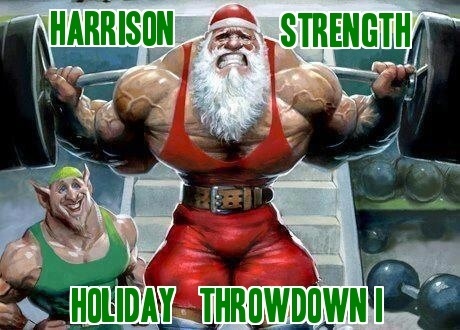 The Harrison Strength Holiday Throwdown is an event being held in support of the Toys For Tots Foundation. The entry fee for all competitors will be a new unwrapped toy. Spectators are also encouraged to bring one to donate as well. Athletes will compete in 3 events and trophies will be given to the top 3 in each weight class. Heat orders will be determined by the date registrations are received (ie. the first athletes to register will be the last to go and vice-versa). NOTE: All athletes must wear holiday related attire! Also, this is a beginner/intermediate level event JUST FOR FUN and to support a good cause! So don't be afraid! Registration is capped at 10 entries per weight class! With a continuously running clock, athletes will complete 3 reps the first minute, 4 the second, 5 the 3rd, 6 the 4th, etc. 6 minute time cap. Final minute will be for max reps.
carry the contents of the sled one by one 40 feet back to the opposite side! Score will be fastest time. 2 Minute time cap. With a continuously running clock, athletes will have 90 seconds to lift Santa for as many reps as possible! Score will be total number of reps completed.